The plug-in hybrid Volkswagen Golf GTE (see description here) is now on sale in the UK starting at £28,035 (approx. 42,700) after the £5,000 Government plug-in car grant. In the UK, Golf GTE is available through all of the company’s franchised sales outlets, while all-electric e-up! and e-Golf are only offered through a network of 25 e-Retailers. This probably indicates that Volkswagen expects significantly higher demand for plug-in hybrids than all-electric cars. Time will tell which branch does better. 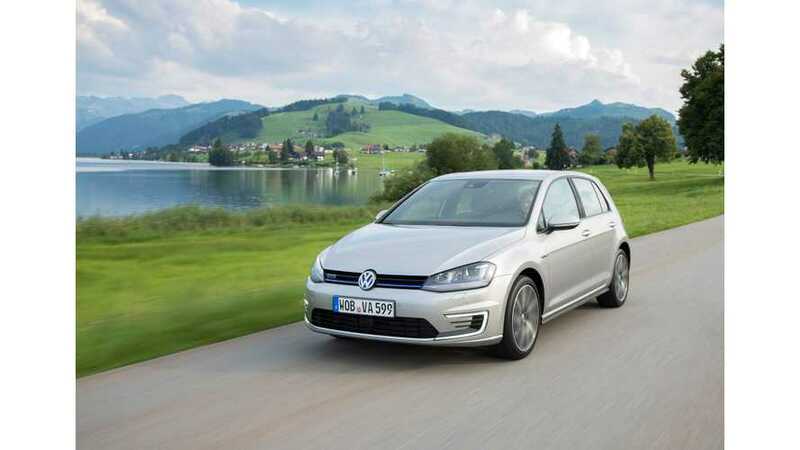 With up to 31 miles of range on an 8.8 kWh battery, Golf GTE is now another choice among the expanding lineup of electrified cars available on sale. "The name of Golf GTE reflects its standing in the line-up alongside the petrol-powered GTI and diesel GTD, while its pricing also reinforces this position. The new car is driven by two engines: a 1.4-litre 150 PS TSI direct-injection petrol engine and a 102 PS electric motor. Together, they produce a maximum power of 204 PS and a theoretical range of 580 miles, while maximum torque is 350 Nm (258 lbs ft). A six-speed DSG gearbox developed for hybrid vehicles is standard. The electric motor is integrated into the gearbox housing, while further hybrid components include power electronics and a charger. An electro-mechanical brake servo and an electric air conditioning compressor make for energy-efficient braking and air conditioning. There are five operating modes: ‘E-mode’, ‘GTE mode’, ‘Battery Hold’, ‘Battery charge’ and ‘Hybrid Auto’. In pure electric mode (activated at the press of a button), the Golf GTE can travel up to 31 miles. Electric power can also be saved – for example when driving to a zero-emissions zone – and in electric mode, the GTE is capable of speeds of up to 81 mph. With the TSI engine engaged as well, the Golf GTE can sprint from zero to 62 mph in 7.6 seconds and on to 138 mph, yet returns a combined cycle figure of 166 mpg and CO2 emissions of 39 g/km. As such it is expected to be exempt from VED and the Congestion Charge. The Golf GTE’s 8.8 kWh lithium-ion battery can be charged in 3.75 hours from a domestic mains outlet, or 2.25 hours from a domestic wallbox. The Golf GTE is available in five-door bodystyle only and in one highly-specified trim level. Visually, it combines elements of the e-Golf and Golf GTI, with C-shaped LED daytime running lights (e-Golf) and aerodynamic horizontal ‘fins’ (GTI). Where the GTI features red, the GTE has blue accents, including across the radiator grille and into the headlights (which as on the e-Golf are LED), while 18-inch ‘Serron’ alloy wheels are fitted as standard. Inside too, the GTI’s red highlights are turned to blue – including the stitching on the steering wheel, gear lever gaiter and seats, and a blue stripe in the tartan pattern on the sports seats. Touchscreen infotainment system with DAB radio and Bluetooth is standard, while optional navigation includes bespoke EV features such as the ability to identify potential destinations on electric range, and charging points. The GTE also has an e-manager which allows the driver to preset vehicle charging, as well as interior cooling or heating and these functions can be operated remotely using the Car-Net app on a smartphone; a three-year subscription is standard in the UK. The speedometer and tachometer are familiar, and the latter is supplemented by a power meter in the central display, which shows the status of the battery, whether or not power is being used and the intensity of any regeneration."